There is a lot that we still do not know about the biology and ecology of sloths. While many websites and institutions will cite incorrect information, we will not report any information that does not have strong scientific evidence. Although commonly referred to as two-toed sloths, this description is somewhat misleading as all sloths have three toes on the hind-limb. The true difference in digits lies in the forelimb, with sloths in the Choloepus genus having two fingers. For this reason, the correct terminology should be two-fingered sloth, a term which has now been recognised in several scientific publications. Two-fingered sloths are much larger than their three-fingered counterparts, reaching 80 cm in length and weighing up to 11 Kg (although the average is 6-8 Kg). They have a long, pig-like snout and can sweat from the very tip of their nose when hot or stressed. Their hands and feet have fleshy, hairless palms and soles. 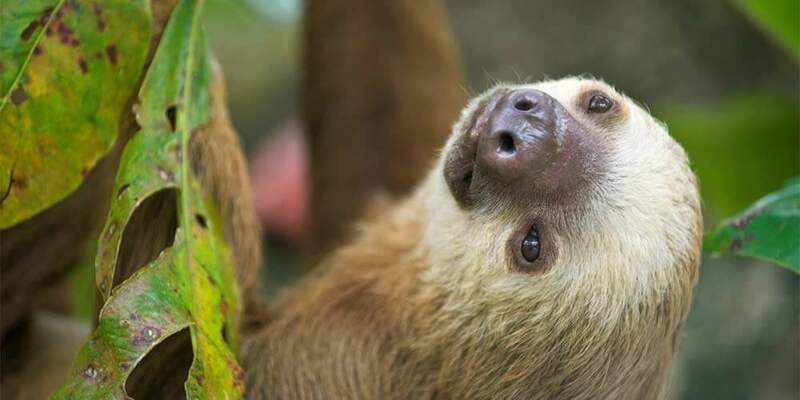 They have long, brown hair which is lighter in colouration around the face and can stand on end when threatened, helping to make the sloth appear larger. Two-fingered sloths are more active and generally faster-moving that the three-fingered sloths. Their activity was considered to be primarily nocturnal, although recent evidence suggests that activity spans the 24 hour period equally. Sloths are famous for their unusual and bizarre bathroom habits – two-fingered sloths will only relieve themselves once every 5 days and they will only do it on the ground. Sloths have been known to lose up to a third of their body weight in one sitting! This weird weekly routine remains one of the biggest mysteries surrounding sloth behaviour and one that scientists have struggled to explain for decades. The likely explanation is that it’s all about communication and reproduction. As with three-fingered sloths, two-fingered sloths appear to have almost completely sacrificed the energetically very costly ability to maintain a stable core temperature. Similar to many poikilotherms, they rely on behavioural methods of thermoregulation (basking etc.) and can exhibit daily fluctuations in core temperature of up to 6°C. This fluctuation is in stark contrast to most endothermic mammals, which are able to maintain a constant core temperature of approximately 36°C regardless of the ambient temperature. Although virtually all mammals possess 7 cervical (neck) vertebrae as standard, sloths are one of the few mammals to break this rule. Two-fingered sloths and manatees retain only 5, while three-fingered sloths have 9. This allows them to effectively scan for danger and look around without moving their entire body, which saves energy and reduces the risk of being seen by predators. Two-fingered sloths also have constantly growing teeth, but with no incisors or true canines. The first tooth is a pseudo-canine which, although looks similar to a typical canine, is actually referred to as a caniniform. The teeth lack enamel, consisting only of dentin. As the sloths teeth and nails grow continuously throughout their life, it is impossible to determine the age of a wild sloth. There are a lot of incorrect figures cited for the lifespan of sloths, however the truth is that we still do not know how long they live for in the wild. Captive sloths are known to reach 40-50 years old, however sloths were not bred in captivity until 50 years ago and so there has been little chance for any individual to exceed this figure. In addition, no one has ever followed a wild sloth from birth until death, and so any estimations on wild sloth longevity are based on no factual evidence at all. 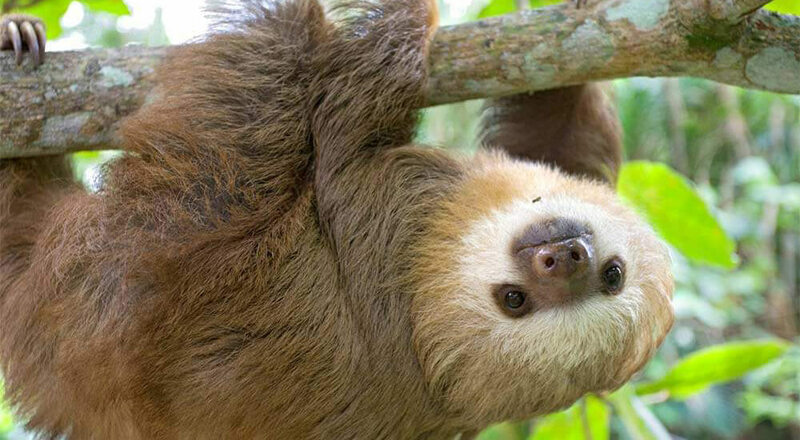 When we consider that sloths in captivity often have elevated stress levels, an excessively sedentary lifestyle and an unnatural diet that is overly high in fructose (diets in zoos typically consist of fruit and vegetables as they cannot source the new-growth tropical leaves that form the sloths natural diet), it seems likely that wild sloths may live longer in the wild than they do in captivity. In a similar manner to the three-fingered sloths, their hair is specially adapted to facilitate the growth of symbiotic algae and fungi. Each hair has a unique groove running along the length of the shaft which traps moisture. The algae and fungi that grow make the sloth appear green which facilitates camouflage in the rainforest canopy. Some species of fungi living in sloth fur have even been found to be active against certain strains of bacteria, cancer and parasites! Alongside hosting algae and fungi, sloth hair also provides home to an entire ecosystem of invertebrates – some species of which are found nowhere else on earth! A single sloth can host up to 950 moths and beetles within its fur. These colonies of invertebrates don’t appear to bother the sloth: they merely lay their eggs in sloth faeces and may feed on the algae and fungi found within the hair. Sloths do not eat the algae and fungi growing on their fur. This has been hypothesised but has never been observed in wild or captive sloths. 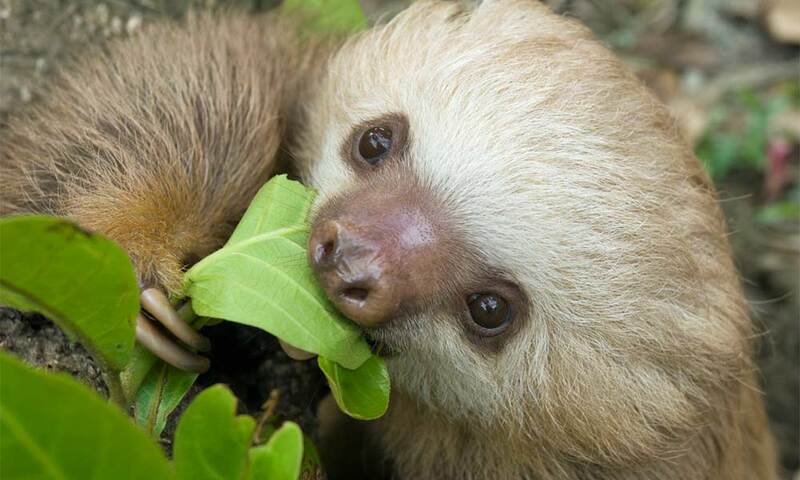 Due to their extraordinarily slow metabolism, two-fingered sloths have one of the slowest digestive rates for any mammal, with approximately 30 days being taken for the passage of food from ingestion to excretion. They have large, multi-chambered stomachs which contain symbiotic bacteria to assist with the breakdown of cellulose in their fibre-rich diet. Two-fingered sloths are primarily folivorous, meaning that they subsist on a diet almost entirely made up of leaves; however they will also consume flowers and fruits. It has been noted that two-fingered sloths will eat small rodents and reptiles, but this has never been documented or observed and seems very unlikely. It is more plausible that any animal-matter ingested would be in the form of insects on the leaves they are eating. 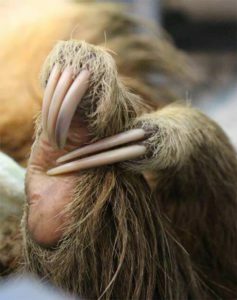 Two-fingered sloths have never been observed drinking in the wild, and it is thought that they get all necessary fluid from the leaves that they eat. This was also thought to be the case for three-fingered sloths, but recent reports have shown sloths lapping water from the surface of rivers. Two-fingered sloths will readily drink water in captivity, and it therefore seems likely that wild sloths may also display this behaviour. Due to the cryptic nature of these animals, observational research is therefore very difficult and much of their ecology remains unknown. Two-fingered sloth have a gestation period of 11.5 months. Females give birth to a single young, usually weighing between 300-500 grams. The baby is born ready to face the world, with fully formed teeth, eyes open and a strong instinct to cling onto the mother’s fur. They do sometimes fall, but sloths are incredibly resilient and have been known to survive a drop of over 90 feet (thanks to two-fingered sloths boasting an impressive 46 ribs to protect their internal organs)! 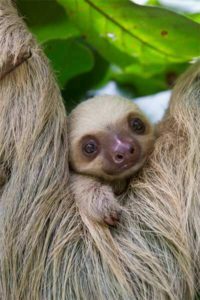 A baby sloth is thought to stay with the mother for a full 12 months, during which time it learns all of the essential skills required to survive in the wild. As well as drinking milk, the baby will begin to sample leaves from around the mother’s mouth from as early as 1 week old. This process teaches the offspring exactly which tree species are safe to eat. Following the weaning process, the mother leaves her territory to her young and establishes herself elsewhere. The Hoffmann’s two toed sloth can be found inhabiting tropical forests ranging from sea level up to 3000 meters. 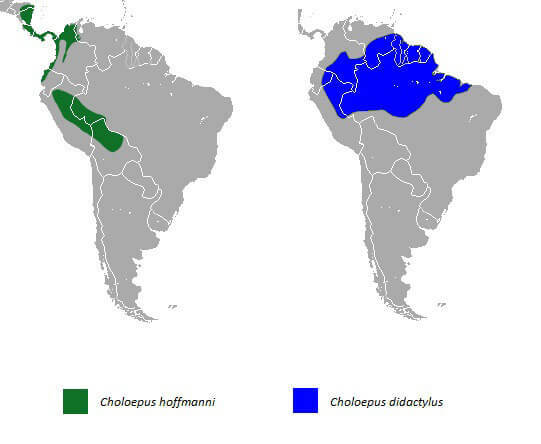 There are two separate populations of C. hoffmanni, separated by the Andes. The most northern population ranges from eastern Honduras to western Ecuador, and the southern population ranges from eastern Peru to western Brazil and northern Bolivia. These two populations are thought to have diverged up to 7 million years ago. There are 5 suggested subspecies. The Linnaeus’s two-toed sloth is of similar appearance to C.hoffmanni, but has much darker colouration on the snout, hands and feet. This species ranges from Venezuela, the Guyanas and Colombia to Ecuador, Peru and Brazil north of the Amazon River. There is some evidence to suggest that they also extend into Bolivia.